Munich - A number of youngsters made their mark on the German top-flight this season. Mario Götze's superb form earned him a transfer from Borussia Dortmund to FC Bayern Munich, while the Bavarians' David Alaba played an integral part in the club's road to glory. However, as impressive as those achievements were, they didn't get your winning vote. 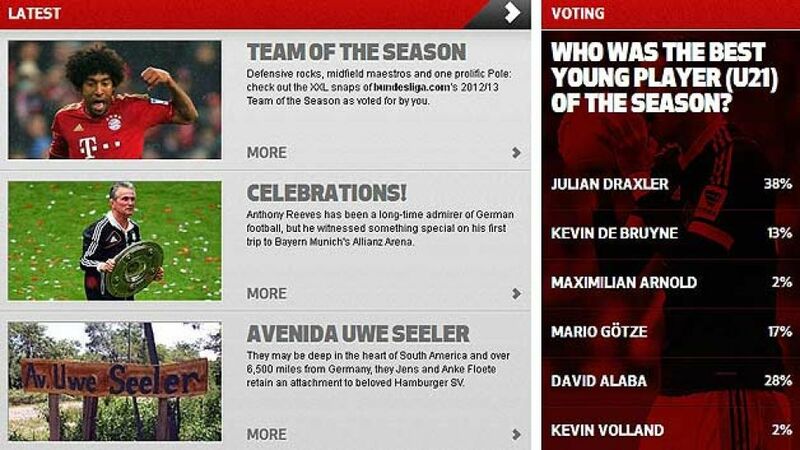 That accolade goes to FC Schalke 04's Julian Draxler, whom readers of bundesliga.com voted as the best young player of the season. After becoming the youngest player in history to make 50 Bundesliga appearances last September, Draxler showed maturity that belied his tender 19 years to help Schalke meet their top-four objective and emerged as the clear winner of the vote with 38 per cent. After a tricky winter period, he took the team by the scruff of the neck and helped them to UEFA Champions League qualification, scoring massive goals against derby rivals Borussia Dortmund and fifth-place SC Freiburg in the process. The club will be delighted to have tied such a talent down to a long-term contract in May. Alaba (28 per cent) was a reasonably close second after helping Bayern to Bundesliga, UEFA Champions League and DFB Cup success, while Götze's ten goals and eight assists helped him to third. Werder Bremen's Kevin de Bruyne's ten goals and nine assists gave him a creditable 13 per cent of the vote, while VfL Wolfsburg's Maximilian Arnold and 1899 Hoffenheim's Germany U-21 international Kevin Volland brought up the rear with two per cent of the poll apiece. Don't forget to check out our Fanzone page this coming week to have your say on the 2012/13 campaign.